Making these aape again as they are perfect for this cool and rainy weather today! Jalapeno Poppah Aapah! Crisp on the outside, fluffy inside with a yummy jalapeno popper flavored cheesy center! You all know that I am going crazy with my aape pan! The charm of eating my favorite fried foods using just a couple of drops of oil, is very alluring to me. I made dosa batter for my children who love dosas. So when my husband, who loves aappe, was looking for a quick bite before dinner, I thought of giving this appetizer a try, using the same batter. Psst…I love jalapeno poppers and was hungry too 🙂 Needless to say, it was an instant hit and loved by all! Sweet Potato Chips in 3 ½ minutes!! You are speaking my language!!! I love jalapeño poppers! Then you will like these for sure Greg. I love jalapeno poppers too! Thank you Marisa! I hope you had a great Thanksgiving! Sandhya, what perfect looking poppers! I bet they taste as good as they look! These look amazing Sandhya – I love whatever pan it is you are using to get these results, I don’t think I’ve heard of it before, but they sure sound yummy! Loretta, I hope you had a great Thanksgiving! I got my aape pan from India but after I wrote this post some friends bought it in stores and online. It is called the ebelskiver pan. Sandhya thanks for reposting since I had missed this earlier! 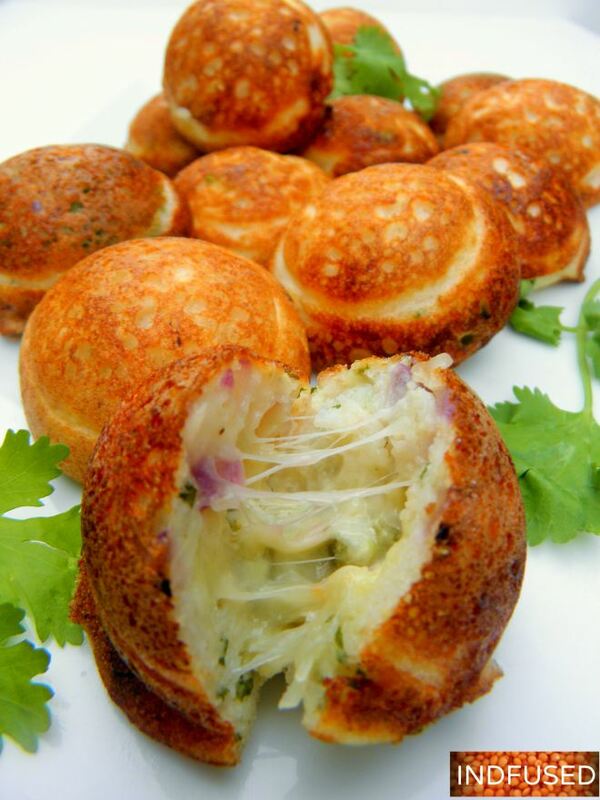 How lovely and how ingenious to make halopeno poppers in an appam pan!